The album of 2014 is here”…This is the statement proclaimed by Candlelight Records, the underground British company that will release on September 16 the new album by the Extreme Symphonic Metal band XERATH rationally titled “III”… Is this a marketing trick ? Does, this new disc really contains something really innovator like the essence of a real musical revolution ? 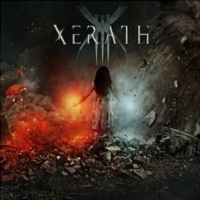 I wasn’t exactly convinced by the early couple of albums released by XERATH, but I have detected some interesting moments, a rough potential, a fertile ponds to a still raw ideas and some sonic inventions…So, instinctively I knew that they were able to deliver a strong piece of blistering Steel . Well, i wasn't prepare for this seism, with “III” , immediately I was positively shocked by the new refinement of sound, the production handled by Danish studio wizard Jacob Hansen (ANUBIS GATE / MERCENARY / MALRUN / VOLBEAT) is more than effective, and it sounds like a million bucks work, the new songwriting method is honored by a fresh and perfect balance between the dark drama orchestrations and the ultra complex Metallic riffage and odd structures, on top of that, the band succeed to improve themselves, they manage to create an apocalyptic ambiance and reveal a new identity with this unique, homogeneous mix of elements, an obvious specificity and henceforth a signature for the band…The majestic opening track “I Hold Dominion” is exemplary of this matter of fact . Musically XERATH still hold a complex avant-garde attitude and a fierce determination, faithful & addicted to this spirit but also devoted to a very personal groove (the clever “Bleed This Body Clean”/ ”Death Defiant”), the tightness of the rhythmic parts is only matched by the full-blown operatic orchestrations, the flagrant Proggy penchant are also pushed to the max with brio and confidence (the industrial chaos of “Passenger”) using a new found mania in the obsessive themes and hypnotic riffs (“Ironclad”) even a few ambient effects, each new track is holding its own universe, a very intense, mostly epic and thick music score (“Veil-part 2”) , an absoute euphonic dominion set in an distopian prospective and harmonized in a chaotic vision . Vocally a metamorphosis had occured in the Richard Thomson's vocal style, switching from his traditional gutural only habits, to a fresh polyvalency for some new reinforced shrieks-not unlike Alexis Laiho (C.O.B.) typical blackened scorched screams- and some fantastic cleanest singing aswell like “I Hunt For The Weak” where the Björn Strid’s (SOILWORK / NFO) connection is prominent . Anyway if the extremism is predominant, the dynamic of the album is pretty effective, even surprising, indeed the play order is shifting from one mood to other in the infernal course of the running list. XERATH also possess a new secret weapon in the person of new guitarist Conor McGouran, who unleash an impressive slab of furious shredding but he’s also a real accomplished musician, owner of a fat and tasty tone (“I Hunt For The Weak”), sometimes very discreet, able to alternate the different techniques with ease, adapt his playing in the more subtle steady moments (“Veil-part 1”) and keeping a perpetual unity in an always changing mode of vibes (the raging “Autonomous”) uplifting the whole song to a magic, because of his part to an unexpected degree and finaly reaching an higher territory (“Sentinels” and its ending solo) . For almost 70 minutes and fourteen tracks England's XERATH, will demonstrate its exceptionnal musicianship, its mastery both in the arrangements but their also quite prolific talent in the melodic hooks (the amazing “2053”/ “Demigod Doctrine”) buried under layers and layers of textures and a flurry of screams with maybe as only serious contender Mister Devin Townsend himself…This is easily the album of the year as far as the Extreme Metal crown is discussed.